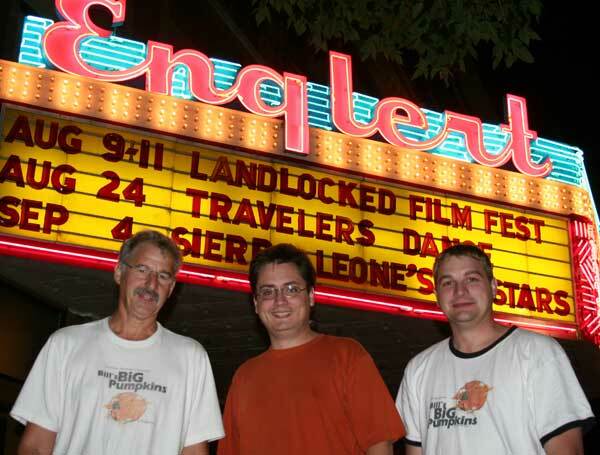 BILL'S BIG PUMPKINS had a "sold out" crowd at the Land Locked Film Festival in Iowa City, Iowa on August 11th. They had to bring in more chairs to accommodate the large crowd. And a lively crowd it was. The film was very well recieved. After the screening, Bill Foss was meet by an enthusiastic crowd who asked questions, wanted seeds and more insight, as well as his autograph. It was quite exciting. At the Landlocked Film Festival awards ceremony that evening, it was announced that BILL'S BIG PUMPKINS took 2nd place Best Documentary Feature, beating out some stiff, and impressive, competition. Here's the winners list (PDF) and originating website (LLFF 2007).